What doesn’t kill you makes your stronger they say. 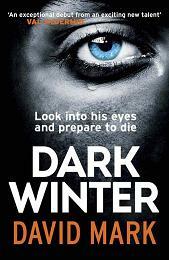 Maybe, but not for some of the poor sods in David Mark’s splendid debut novel Dark Winter. Set in a wintry Hull in the east Riding of the giant English county of Yorkshire (The Texas of England in my book), the first of a series of murders is off young woman is hacked to death in the Cathedral during a pre Christmas Evensong in full view of the congregation. The protagonist, Detective Sergeant Aector McAvoy was in attendance and was in close quarters to the murderer but the killer was too quick and slipped like sand through McAvoy’s fingers. More murders ensue of course and are seemingly unrelated to one another except for one thread: they had all been sole survivors of past tragedies but during the course of this novel, had met their end violently in the manner from which they had hitherto escaped all those years ago. McAvoy is Scottish, hailing from outside Edinburgh. A gentle giant with a conscience the size of a small country, this serves as his moral compass by which he charts his course, a course from which he does not deviate either for sake of expediency or easy life. This is the one of a few off the key planks of the conflict that exists between him, his colleagues and the top brass in the police force. He wears his heart on his sleeve and is given to Kevin Keegan-esque fits of emotion which raise an eyebrow or two when the pressure gets a little much. He is set apart from his colleagues for being the whistleblower who blow open corrupt CID team that led to the dismissal of a Detective Superintendant and some of his erstwhile colleagues being transferred out. Those around him don’t entirely trust or rate McAvoy. A lesser man would have skulked off to lick his wounds as a security guard or in a desk-job but McAvoy clings to his course and sails in that direction throughout the novel. His frame is mentioned quite a few times in the novel in juxtaposition to how it belies his actual nature. Brooding, emotional, conscientious and fair. In fact, there is something of the Shrek or the Beast from Beauty fame. This character has rich deep roots in world literature and Mr Mark has expertly reinvented and renewed this character in this novel. The dialogue is realistic, witty where appropriate and the register aligns totally to that of the characters which is a skill in itself. The narrative is well paced, never dull and the plot and how it unfolds is peeled before the reader at a rate and manner that resulted in me reading this book in two sessions. The plot twists are believable, surprises are peppered deftly without making the reader sneeze and the climax was truly a paragon of excitement, breathlessness and genuine terror as the personal life of McAvoy and that off the killer crossed paths resulting in a race against the clock and a denouement worthy of a Bond movie. Last but not least, Hull, not exactly New York or Chicago, London or LA, proved itself a silent but brooding atmospheric character in its own right, one whose hands shapes the minds, hearts and lives of those who live there especially those in the novel itself. All places have this quality but its few authors who can skilfully transfer this to the page. Mr Mark did this in spades. Crimewriter & noirista. Author of 'Two Shades of Darkness' on Kindle. Ooh this is the second great review of this I’ve stumbled across this morning – going on the (heaving!) to-read pile!